Outset Swindon client Alex Secker is certainly someone who can say “I’m glad I did” rather than “I wish I had”. With a young family to support, 23-year-old Alex’s life was turned upside-down when he was made redundant. When his partner obtained a good job, he seized the opportunity to fulfil his ambition of starting a business. Alex’s father worked for Sony, so he grew up playing around with cameras at home and started to make videos as a hobby. Deciding to turn his hobby into a profession, he set up 22six Productions, with the aim of creating videos and films for a wide range of clients. However, he soon had doubts about the likelihood of creating a successful business. “I had no idea where to start. There is so much that you need to know.” Unable to claim benefits, he looked for paid work again but could only find temporary employment in fields that did not interest him. Alex visited the Citizens Advice Bureau, who told him about the Outset programme. The fully-funded Introduction to Enterprise and Business Start Up sessions gave him an insight into all aspects of running a business. In particular he learnt the value of market research and how to price his services correctly. Having done work experience himself, Alex understands its value and takes on students to help him with filming. 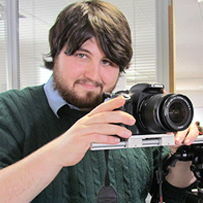 He collaborates with local businesses such as Swindon Viewpoint, Firebird Films and Infinite 8 Productions. Eventually, Alex hopes to build the business enough to take on permanent staff. His long-term aspiration is to make feature films and television shows, and to establish his company as an international brand.